Cold from Seattle to Sao Paulo | Watts Up With That? From the “weather is not climate” department. I noticed something interesting in the NCEP forecast for the coming week. 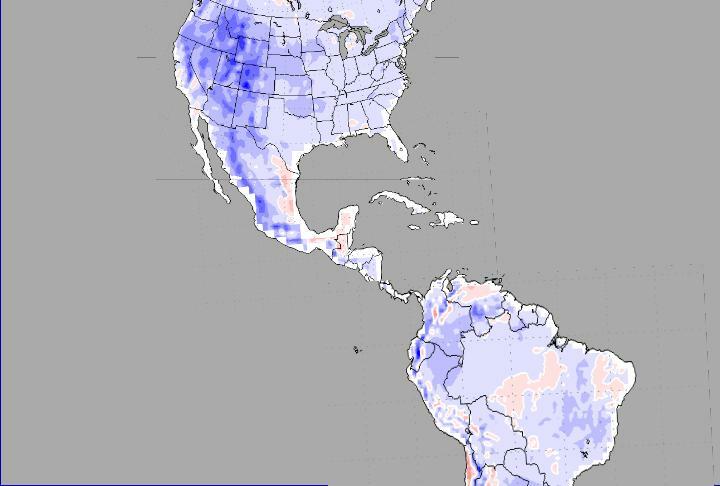 Temperatures are predicted to be below normal across a 7,000 mile swath of the Americas. That is more than one fourth of the way around the earth. Below is a composite image of generated from three of the NCEP maps. Looks like another cold soccer Saturday, across the entire US. Of course there are other places on the Earth that will have above normal temperatures, but this seemed noteworthy for the dual hemispheric scope, even it is just “weather”. April 28, 2010 in Forecasting, Weather. Should be noted that the US NCEP map has changed since early this morning, when it showed below normal for the entire US. try this one if you are looking for more warmer places. They seem to be few and far between. These forecast are NCEP Europe into winter this year. It should be noted that above normal temps in the first part of April triggered the warmistas to claim a total smackdown. Weather is certainly climate. If weather weren’t around, we wouldn’t have a climate system! Here in Calgary it started raining during the night, but during the morning it changed to snow. I just had to brush a few inches off my car to get lunch. On Saturday night we got about 6 inches of slush. One of our biggest dumps of snow on record was March 17, 1998… it seems that once el Nino falters we get slammed. Thankfully, this has shut down the doomsayers who have been screaming “drought” just because we had a few weeks of relatively calm weather. Why do I get the feeling that the blueness of these individual maps won’t bring down the all-knowing “anomaly” number for the month? The longer arctic sea ice beats 2003 the better. Where’s the heat! We’ve lost the heat! It must have gone even deeper into the ocean! Kevin T – FIND THAT HEAT! Here in the desert southwest of the US the weather (climate?) is just gorgeous. Shouldn’t there be a bright red anomaly wherever Al Gore or James Hansen is? Al Gore Spoke. Isn’t it Obvious? People ask why we pay attention to Al Gore. When Al Gore speaks, Gaia listens!!! yep. i am located at that dark blue spot in california. one or two snowstorms in april is normal and tolerable, but this is getting old. it’s california for crying out loud! this one came in with hurricane strength winds, which broke up the ice on two of our lakes, finally, a month late. but we have two more lakes still frozen! I know that Texas has been cooler than is normal. The plants in my garden have been growing more slowly. It might be a good thing that I decided to change the tomato plants to raised beds so the soil will be warmer. No wonder they have been in such a rush to try to get cap and trade passed. They aren’t just racing against the clock, they are racing against a dropping thermometer. Is the CRU that provided the monthly climate averages the same CRU that has had such issues over their data? Just asking. Below the US, the real geographical southern hemisphere it is the PACIFIC sea. It is a current delusion to think South America is southwards the US. The South American WEST coast longitude it is the same as New York= 75°W. Capisce? Winter seems to be holding on a long while here in SoCal. Cold and mid 50s this week with +60mph winds. This is Feb/March weather. I know, weather =/= climate but my electric bill is loving the cool weather. When all is said and done, this will be the warmest April on record. Count on it. Anthony said “Please no grousing about the USA being in °F and South America being in °C. That’s the way NCEP provides the maps. – Anthony” but actually they aren’t that far apart. The range on the Fahrenheit scale is +/- 20 while that on the Celsius scale is +/- 10. Since one F is 1.8 C, a direct conversion from C to F would show the C scale as +/- 18 degrees, close to the current magnitude. In other words, no need to grouse as the color scheme for the two maps is quite comparable. It’s been darn cold in the Reno – Tahoe area for the entirety of 2011. I guess that’s a new meaning for “keep Tahoe blue.” That’s why I am amazed that alarmists will hollar out without chagrin that last March was the hottest month in the history of the planet Earth (I paraphrase) . Cold asks for reclusion and thinking whether Warm for going out and diversion. This is why our Climate Big Brothers go from tropical island to tropical island all the time, though they prefer some cold “delikatessen”as caviar and free and friendly companions. 13 days of spotless sun. interesting correlation. But what about the World? Are there more reds or blues? REPLY: Nice job, looks like you had no trouble at all zooming those web pages to fit. looks like you had no trouble at all zooming those web pages to fit. It’s been darn cold in the Reno – Tahoe area for the entirety of 2011. Uhhh… did I just do a Rip Van Winkle? I coulda sworn it was still 1967…. The map showing warming in northern, central and south part of Argentina is wrong. Utterly wrong. You can check the forecast for the central part of the country in: Pilar where it shows temperature to be at the absolutely normal level: maximum of 27ºC for saturday and minimum of 11ºC for tomorrow (3ºC below normal) and 17 – 18ºC for the rest of week, hitting the bullseye of normal temps. UAH global anomaly is still very high, though. But I wouldn’t be surprised if anomalies drop significantly over the next few months. We are back to chains again. Most of us have taken off our snow tires (by law) but anyone going over Meacham or Tollgate in the Blue Mountains of NE Oregon last night came down the other side praying they would make it through without sliding off the snow covered winding roads. This will kill spring wheat on the upper slopes and could damage emerging winter wheat as well. The roads have cleared for now but tonight will likely bring another blast of snow. Yes, but Phil Jones early work did not have the issues that befell it before getting associated with the wrong crowd. And I believe he released that data. The globe is cooling even compared with Phil’s good data sets. 13 days of a spotless sun, with lots of white-light facula producing Active Regions. What that does, I cannot say. But, if it does something to the climate somehow, it’s interesting bad news. It seems this gonna be OK; it looks like they are using lunar phases for weather changes which is OK. (May 6th). If models don´t work it´s time to get back to traditional knowledge….just in case. You caught my typo. I meant to say 2010, and I should add ‘thus far’. Well, here in the Northwest, the forecast is highs in the mid/high 50’s and lows in the mid/low 40’s. Guess I’ll have to light the fireplace and find a bottle of Pinot. Shucks. We got hammered in northern Vermont last night by more than a foot of scientific hot air. Unfortunately we changed to summer tires last week with all of the talk of global warming and I almost lost my new car having made it through another Vermont winter without an accident. After I went in the ditch the second time and getting out to survey the damage I could barely stand on the white stuff without falling down. The tow truck slid all over the road coming uphill in four-wheel drive. The tow operator even had a hard time keeping his truck from sliding as he winched me out. The good news is that after sliding sideways past the guardrail, driving over and under downed trees, and getting winched out of the brook my new car did not have a scratch. That scientific hot air sure is slippery though. Dagon, you are joking, yes? Otherwise we apparently need to throw out what farmers understand to be “climate zones”. It was below freezing here this morning, and the growing season is well under way. It’s still April so that can happen, but jeez. This winter is never going to end, I don’t care what the calendar says. We’ve been way below normal for the last couple of weeks; a few nice days here and there, but for the most part it’s been pretty chilly. This time of year I sleep with only 2 sheets on the bed-no cover. Last night I decided it was going to be a 1 sheet night. I should have checked the local meteorologist forecast. I froze . You know ,when you are too sleepy to pull up extra cover? I didn’t know the forecast was 15 degrees below normal . Where was the Watts man? I did query the eldest of our clan the other day and they remarked that it is starting to feel alot like 15 or so years ago. We live in Central Kalifornia, FYI. We are headed into the fifth week of the soccer season in Colorado, and the fifth week of snowed out, rained out or just bitter cold Saturdays. One week I had to coach two games and watch a third, in 35 MPH winds and 45 F temperatures. I was nearly hypothermic by the time I got home. We only have three weeks left to the season, and I am starting to wonder if we will have any pleasant weather. Here in Boston, the TV weatherman just said that this will be one of the warmest Marches ever, even with the current below-average temps. So what’s the point? You could pick out somewhere in the world every day that is “below average.” The pettiness of this sort of post just makes AGW skeptics look bad. Must be all that warm El Nino water making South America cold. Cold is the new hot. Since then, climate has retreated into computer models and all subsequent meteorological events (besides Katrina of course) have been weather. Climate is waiting for “natural variability” to go away, before it comes back out of hiding. Um, and where in this post did it say this had anything to do with global warming climate change? I read the post as a simple curiousity…oh look the whole western hemisphere is showing below average temperatures. That’s definitely not the same as the (trivial) “somewhere in the world everyday that is ‘below average'”. MarkB, weather variability is what defines climate zones. The mean, range, mode, and median and cloud days are all important farming statistics, including day to day, month to month, season long, years long, and decades long data. Doesn’t anyone study how food is grown anymore? Last weekend was especially cold I thought. I took the garbage out one night and swore I saw snow. My run on Sunday evening was absolutely brutal, as the wind was smashing me from the north and I was getting speckled with rain. What’s funny is how fast the CAGW crowd is to say “it’s just weather, not climate” when it’s cold, but when it’s warm, it’s global warming. The thing is, it’s so easy to get it into your mind that the local features are tied to global warming (or not). Anytime I think I get a feel for it, the weather changes a lot. Fort Collins is particularly interesting, as I heard repeatedly in 2005/2006 how the recent years’ drought was due to global warming. Funny, now that we’re getting a lot more precipitation, suddenly THAT is caused by global warming. The cold may well be due to the cold sea surface temperatures . I know we are told things are actually hot – but it certainly does not look like it – the Gulf of Mexico and the Atlantic seaboard of North America are very cold so the North Atlantic Drift (Gulf Stream) will be cool. The mid-Atlantic is cooling and the El Nino Modoki is fading. Its starting to look like Joe Bastardi will be right about a significant temperature drop this year. Tucson will end the month with no ninety degree days. The average first ninety degree day is April 10 although in the last thirty years it has been April 3. The cold may well be due to the cold sea surface temperatures . The North Pacific is cold, from Japan all the way over to California. Doesn’t matter whether it’s storming or not, the air coming in has a real bite to it. And I’ll ask you: What’s YOUR point? Big F-ing deal about the warmest March “ever” in Boston. New England caught the tail of that massive positive height anomaly that dominated in the atmosphere over northeastern Canada this winter, shunting the cold air to the south. Long time locals here in the eastern sierra (Mono County) say that this is the first time in 45 years that area lakes at 8000 feet have been frozen this late in the season. It is estimated that Mammoth Mountain got another 2 feet of snow over the crest the past 36 hours and it is still snowing! Current temp in town at 9:50 pm Wednesday is 20 degrees! have another 8 inches on the deck at 8200 foot level. The freak event is this british exibitionist being given any credibility by anyone .The sciency nature of his exploration? I missed the daily postings of ,we are in the arctic and its so cold, that gave this guy such credibility last year. I had hoped this year fish and feathers would charge them with illegally feeding the bears, but they are not off the ice yet.What about illegal baiting of the bears?That goofy ice base just teasing the polar bears. Still cannot understand why AMSU-A shows a positive temperature anomaly of 0.87 degrees F at near surface level when all the indications are cooling around the globe. There must be some heat somewhere to produce the warmth anomaly. Anyone with information which can clarify this discrepancy between what I can read in this thread and the Satellite readings? Here in Tokyo we are ending April with only a handful of days above 20 degrees C for the year. We had our last snowfall on the 15th of the month and more than a few days during the month that qualified as bona fide January winter days. We were supposed to make up our weather-cancelled Saturday soccer match today, and instead woke up to an unforecasted blizzard. Our winter started in early October, and is still going strong almost seven months later. A damaging frost here this morning in rural western MD — low 27F (-3C). I’m in a frost hollow, so nothing unusual — frosts in May here are common. But nobody around here plants anything frost-sensitive until after mid-May. Larches and Dawn redwoods here leafed out weeks ago, but their new foliage withstands frosts quite well. Other trees are much more susceptible. 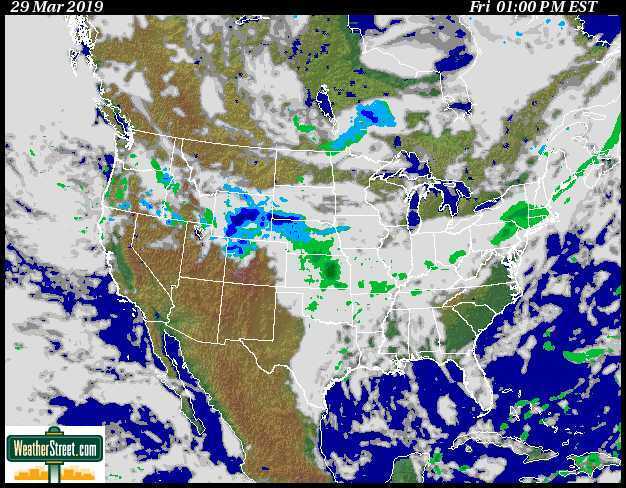 Heavy snow forecast for Arizona on the last day of April. Steve, you beat me to it. My wife and I woke up to find several inches of global warming climate change outside with more still falling! No biking into work/school for us today. Yesterday was a fairly warm day (well, so I was told…I work in a basement at CSU), but today (and the first half of the week) more than makes up for it. And I remember that frigid start to October…I ran the CSU Homecoming 5k in that crap. I had no idea I’d be running in 16F weather with snow/ice! Everyone knows that food comes from the food factory, neatly wrapped, safety sealed and packed, ready for the shelves of your nearest mega-super. Sometimes I’m tempted to ask my students “Where do buffalo wings come from?”…. but I’m afraid of what the answers might be. Gee, thanks Steven. I’m in the darkest blue island in west central Colorado, looking out at 7″ of new snow with an alleged ten hours of precip. to go. If the NCEP predictions are anything like the ones from the NWS last fall for the most recent winter, I can expect temperatures 15°F above normal. Only kidding, as this is only a week out and looks on track so far. I’m grateful to not have changed my studded snow tires yet! I just noticed something a little odd on the AMSU-A temperature graph, one can only select Y-axis as degrees Celsius or Kelvin, yet the little message about the anomaly for the most recent day is °F. Just another annoying little thing, someone likes .87°F (which is not relevant to the data being displayed) better than .48°C. Traction Tires Advised, Oversize Vehicles Prohibited. Compact snow and ice on the roadway. Pass is Open. Seasonal weather reports have ended. Should an incident or adverse weather that affects travel occur, updates will be provided as soon as possible. I like the bit about ‘seasonal weather reports have ended’…I.E. Winter is supposed to be over. I flew from Denver to Phoenix on October 11. It was 18F when I left Denver and 88F in Phoenix when I landed. The hotel shuttle driver wanted to turn the air conditioning on, and I asked him not to. 20F at my house this morning. since global warming has started making spring come earlier i have moved my annual spring climbing trip from april to may, since april has been to cold. now it looks like even the second week of may will be too early. important information to all aspects of climate change. At least spaceweather.com is now calling micro-sunspots for what they are. Manatee cold deaths have way more than quadrupled since any winter since 1974. … As of March 19, biologists with the Florida Fish and Wildlife Conservation Commission’s (FWC) Fish and Wildlife Research Institute (FWRI) have documented 431 manatee carcasses in state waters so far in 2010. This preliminary data indicates that in just three months, the number of manatee deaths has exceeded the highest number on record for an entire calendar year, which was 429 in 2009. The cause of death for the majority of these animals is cold stress. They’ve revised the continental U.S. so that Illinois is going to be above average instead of below average. Awful lot of BLUE on all those maps! CALGARY — A potentially record-setting snowstorm that’s battering Calgary temporarily knocked out power for about 43,000 households. We’ve been skiing powder for the last 10 days here in the N. Central Rocky Mountains of Colorado. A new storm is dumping snow on Breckenridge right now. We should have another foot by Friday morning. The current Winter started on 21 Sept. 2009 with the first measurable and lasting snow; that’s more than seven months of winter, not abnormal for this region/altitude, but definitely no warming here. It’s cold and wintry! This appears to be a color-coded, animated map showing temperature, pressure, and winds over the East Pacific and the U.S. West Coast as predicted for the next 99 hours in 3 hr steps. My apologies if this tries to embed here as an image. Last night’s snow melted off enough today to make up the snowed out soccer game from last Saturday. It was a balmy 48F, with steady 25MPH winds this afternoon. They keep promising global warming – and just are not delivering. No wonder the AG upset with Mann. MarkB says: Here in Boston, the TV weatherman just said that this will be one of the warmest Marches ever, even with the current below-average temps. It’s the computer models that “fix up” those errant temperatures and bring them back to their senses. Can’t have reality messing up a perfectly good narrative, after all. The pettiness of this sort of post just makes AGW skeptics look bad. How does “Climaticus Inverticus” sound as a name for this illness?